Aquaculture, the production of aquatic organisms in controlled environments, has been practiced in several forms in many regions around the world for more than 2,000 years. In the U.S., this art has been practiced for over a century. Initially, during the 1890’s, fish producers in the U.S. concentrated their production efforts on rainbow trout and other trout species. Trout were prized sport fish and enhancement of natural populations through stocking was the goal. The practice was soon expanded to many other species, and even to the introduction and culture of exotic species, those not normally found in the area where they were stocked. Again, enhancement of the local sport fisheries was the goal. Exotic species such as rainbow trout and largemouth bass became popular in many areas. Producers in both the public and private sectors were quite successful and technology improved as formal research into the biology and production requirements of these animals progressed. During the first half of the 20th century, fisheries scientists gradually discovered that natural populations of food fish (those captured primarily in the oceans and in large freshwater lakes) were beginning to decline. As a result of over fishing, pollution, habitat destruction, and a general reluctance to consider marine and freshwater foodstuffs as exhaustible resources, the gap between supplies of aquatic food products and demand began to grow. The disparity between supply and demand grew. Scientists were unable to convince commercial fishermen that the answer to decreasing supplies was not bigger and better equipment. Fisheries scientists, primarily in the public sector, working in the 1960’s began concerted efforts to raise both finfish and shellfish for food. Soon after, the culture of trout in Idaho was successful. Scientists then began answering the basic biological questions and creating the framework for other new local fish production industries. 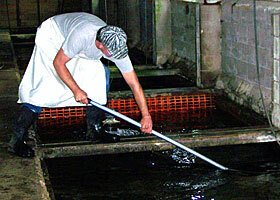 Trout, in the northern tier of states, and catfish, in the southeast, quickly grew to dominate aquaculture in the U.S.
By the 1970’s, aquaculture was recognized as a reasonable alternative to the traditional capture fisheries. Essentially, the move from commercial capture fisheries to controlled production had begun, much like the earlier transition from hunting and gathering, to ranching and terrestrial agriculture. The list of aquacultured species had grown to include salmon, yellow perch, sturgeon, striped bass, tilapia, marine shrimp, freshwater shrimp, crawfish, oysters, clams, mussels, abalone, and sport fishes such as walleye, northern pike, largemouth bass, bluegill, and many other commercially important food fish and sport fish. The resources necessary for continued expansion, primarily high quality water, were becoming scarce. In addition, the environmentally conscious public encouraged limitations on facility discharge, further restricting the growth of the industry. 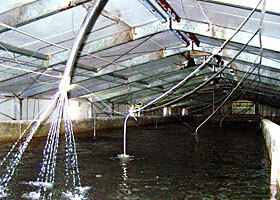 Beginning in the 1970’s, research, development, and demonstration of fish production began on systems with nearly complete water recirculation. These systems conserved water use and water discharge as well. Aquaculture in the U.S. has grown in both relative and absolute terms and is now the fastest growing segment of the U.S. agricultural economy. Trends indicate that U.S. producers are gaining a more significant share of the world market, despite a trend towards investment overseas.